If you like patterns that are fun to make and remind of pattern that your mother or possibly grandmother use to crochet than this adorable Crochet Cradle Purse Pattern is perfect for your next project! These cradle purse patterns were popular back in the 1970's and little girls will love to carry the purse around with them and open them up to make a cradle to place their doll in. 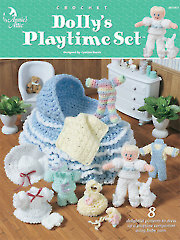 Use a soft sparkling yarn such as Bernat Baby Coordinates yarn and something hard for the bottom like a washed out plastic salad or soup container or recycle any container that you may be throwing out. This make the item more solid and it will not collapse. 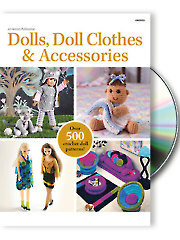 Over 500 crochet doll patterns on one DVD!